When city officials entered the building for the first time, it was discovered that the roof had collapsed and standing water had collected in the orchestra pit area in the main auditorium. A pump system was set up to remove all the standing water and the failing roof was replaced to stop the water from causing further damage. The theater seating was removed and cleanup of the filth, mold, and odor caused by the water began. An additional French drain was constructed in the theater’s boiler room and the orchestra pit area in the front of the stage was filled in with concrete to eliminate ground water seepage. During this time, a truck struck and had badly damaged the marquee of the theater. 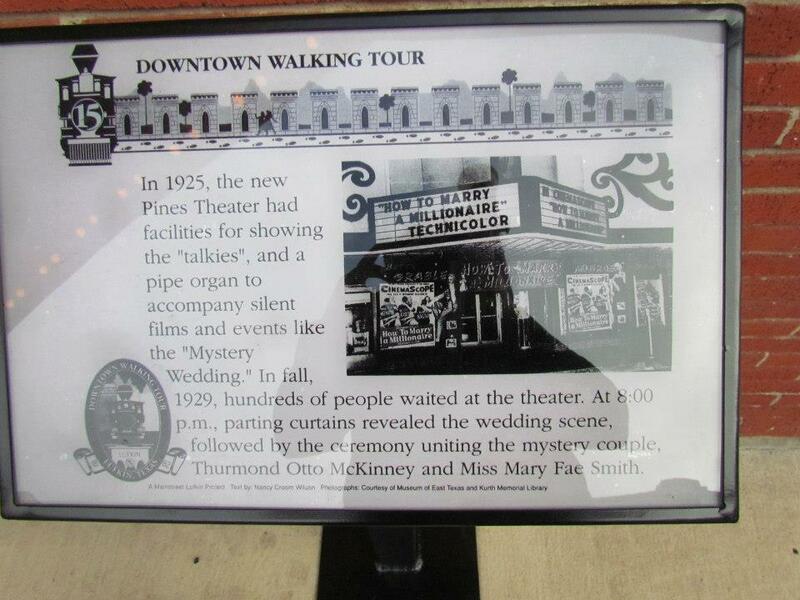 It was decided to have the marquee repaired and bring the front of the Pines back to life. The City of Lufkin spent several months replacing neon, cleaning tiles, reworking the sidewalk and installing bollards to prevent the repaired and refurbished marquee from being damaged again. Over the next three years, the city consulted with a community advisory group and other similar facilities across the state and developed plans for demolition, construction and design. After extensive research and input, the interior was demolished and reconstruction began. Plumbing and electrical work were some of the first upgrades, followed by the removal of walls throughout the facility. Some historical surprises were discovered as crews worked on the theater. Arch brick work that was part of the theater’s original design was discovered following the removal of the main auditorium walls. As crews removed sections of concrete flooring to install new plumbing and electrical work, a staircase which may have gone to a coal bin was also discovered. The theater’s new duct work for heating and cooling was completed and a new mechanical room was installed. Two projectors and supporting equipment were removed from the theater and refurbished by city employees. The projectors were then returned to the reconstructed projector room and are on display to the public. Visitors can now get a look at what once may have been considered the heart of the theater through a large window added to back of the room. Scaffolding was erected to create a complete walking platform that allowed workers easier access to install new ceiling in the auditorium. The arch work discovered during demolition was cleaned and sealed and acoustical material was placed between to add both beauty and sound functionality. Because the theater has been redesigned as a multi-purpose facility, some new areas were developed. An additional staircase and a reception platform were installed in what was once an adjoining clothing store. Also, in the main auditorium, a concrete platform serves not only as a place for the sound and lighting technicians, but also provides room to place tables and chairs as an additional reception area. Stage lighting, professional sound equipment and a new projection screen were installed. The dressing rooms were completely refurbished and green room facilities were added behind the stage area. These amenities provide preparation areas for the variety of entertainment performers that appear at The Pines Theater. The entrance, or concession area, has been refurbished to accommodate a variety of functions. New restroom facilities and most of the building have been made accessible for those with disabilities. Office space, a mechanical room, and additional restrooms are part of the upstairs area, along with the Projector Room Display area and balcony seating. Theater seating was one of the last major items to be placed within the auditorium area. Although it has many modern upgrades, the art-deco charm and beauty of the original Pines Theater has been brought back to life.